I came up with using @tidefordorganics new Sun-dried Pesto. They are a great 100% vegan, gluten free & organic company. So I was honoured when they asked me to come up with a recipe using their new pesto. It worked so well with this recipe, really bold flavours. I love charred Aubergine/Eggplant & stuffing them with this amazing filling was a winner! Grill the aubergines flesh side down until charred. Then Place them into a baking tray, charred side up. Spoon over some Sun-dried Tomato pesto. Place the coated aubergines into your oven set at 180 degrees C for 10 minutes. Meanwhile, in a large mixing bowl mix together the quinoa, red pepper, courgette, onion, capers, basil, 5 tbs of pesto, paprika, passatta & lemon zest. Mix well then season with salt & pepper. Remove the aubergines from the oven, using a fork carefully score & mash the flesh making room for the quinoa mix. Generously spoon some of the quinoa mix into each aubergine. 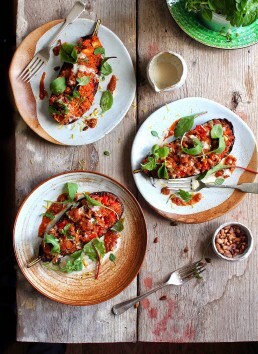 Bake the stuffed aubergines in the oven for 10-12 minutes. Once cooked, serve with additional pesto drizzled over, tahini dressing, rocket & watercress & a splash of fresh lemon juice.